The best home service massage at an affordable price! Our latest massage promo deal.Please check out our other spa services. Massage Promo - Limited time offer! Price increases come into effect Dec 1st 2018. Buy gift certificate/certificates from now until Nov 30th and you can enjoy the current prices for Swedish/Shiatsu/Combination Massage until the end of March 2019. Spiral Spa is specialized for Hot Stone Massage. The therapists are experienced and skilled with this massage. The offer is available to anyone in Quezon City, San Juan, Eastwood, Ortigas and other nearby areas. 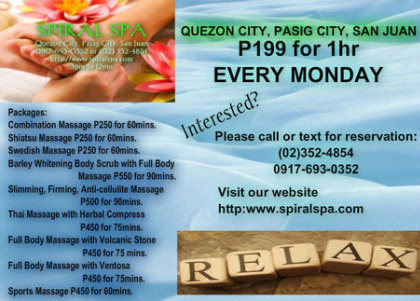 Our aim is to be the best home service spa in Quezon City, to always put our clients first and take care of their well being.We passionately believe in guarding against future health problems through regular massage.Relax and enjoy our home service massage and feel the benefits of our quality spa services. Be the first to know - Discover our best offers, keep up to date with all our latest Promo deals and our new massage/spa services and much more with Spiral Spa Facebook page.